This Monday, April 17, 2017, you can find me toeing the line in Hopkinton for the 121st Boston Marathon--specifically wave 2, corral 4, bib 11281. For many people in Massachusetts, they may feel that running the Boston Marathon is their birthright. I will one up that to say that in many ways I owe my actual birth to the Boston Marathon as my parents first began spending time together when my mother was training for her first Boston Qualifier. Running with a cute Louisville medical student seemed like a good way to drop some extra time. She ultimately ran 3:17 to qualify with my dad pacing her through the last 15 miles, and--as they say--the rest was history. 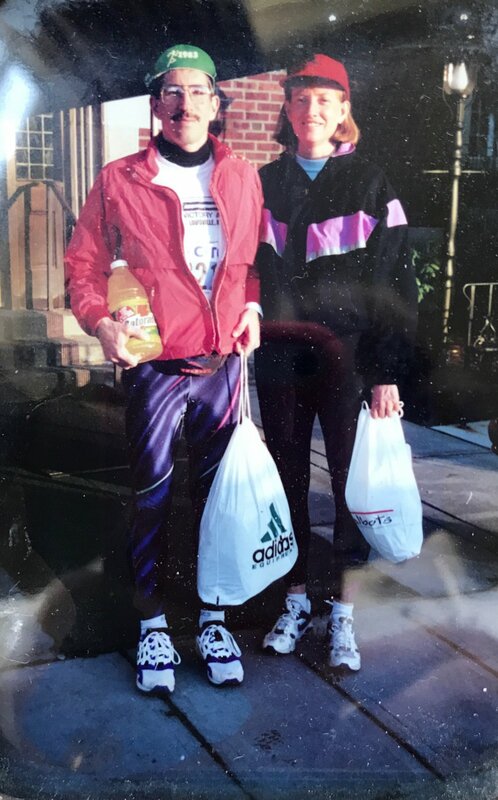 Over the course of their running careers, my parents competed in a combined five and a half Boston Marathons. When the 100th Boston rolled around, both knew they would want to be part of this monumental event, and they were deliberate to register early qualifying marks. Their passion and pride for this race left an indelible impression on my six-year-old mind. As Patriot’s Day approached, Make Way for Ducklings was in heavy rotation for bedtime reading requests, and on race day, I happily shared with my kindergarten teacher (who was a runner) that my parents were competing in the 100th Boston marathon. That pride was enough to overcome some sheepish embarrassment when she shared this fact with the entire class at morning announcements. This Monday it’s my turn to race and my parents’ turn to cheer. I’m so proud to have them here with me to support my efforts to join the family “Boston Club.” As race day draws closer, I realize that I haven’t just been training for the Boston marathon for the past few months; I’ve been preparing for this practically my whole life. And as rewarding as this milestone is, it is not without a dose of unshakable sadness. This April is approaching the two-year anniversary of the death of my good friend and teammate, Nina Brekelmans, who passed away in a Washington, DC accident. Her death left me devastated, angry, and deeply in despair. At the same time, I had been robbed of my usual way of coping with sadness--through running--as I had torn my ACL months before in a non-contact soccer injury. I was broken physically and emotionally, and more than ever I longed for the therapeutic rhythm of running to help me find clarity and process the unimaginable. And yet I could barely walk. On the morning of Nina’s funeral, I was angry at the world. I indignantly shed the full-length leg brace that I had religiously worn for the previous two months and set out for a feeble jog. I wobbled through five minutes of a lopsided crawl before I broke out openly sobbing in the middle of Rock Creek Park. That would be the new normal for the next few months. I flatly rejected that tragedy would define the end of Nina’s story. She was too good a person--too intelligent, too kind, too loyal--to see that disappear. And as I considered how to honor Nina’s legacy more globally, I knew a small part of that had to begin with me. Nina loved running. Though she came to the sport later in life, she took to running with an unmitigated zeal. In a small, personal way, I knew that I could honor Nina by carrying on with the sport despite any setbacks. Over the following year, I threw myself into physical therapy and doctor's visits. I ultimately forewent surgery and accepted that, while I would be able to run moving forward, my future in soccer/skiing/tennis/any lateral sport would be over. When I grew weary or began to pity myself, I would often think of Nina and channel her courage to keep going. And so I trained. I continued running weekly with the Georgetown Running Club (GRC). I entered road races that I wasn’t fit for and logged slower times than ever before. At the same time, I threw myself behind ways to publically remember Nina. I began organizing a memorial 5K at Georgetown University with GRC and the Center for Contemporary Arab Studies--Nina’s graduate program--as a way to bring the community together. Before her death, Nina was preparing to move to Jordan on a Fulbright grant to study the growing women’s athletics movement in Jordan and the broader Middle East. She aspired to create opportunities for women and girls to participate in running as a way to foster women’s empowerment. And to be honest, when Nina first pitched me this idea in the fall of 2014, I silently thought she was crazy. However, it turns out that she was really on to something. In the aftermath of her passing, I began to meet more of Nina’s friends both in the United States and abroad in Jordan. Without fail, people spoke of her kindness, superb command of the Arabic language, and true love for Jordan and its people. It seemed like there was a genuine desire to do something to really honor her life, and this sentiment would ultimately become the Nina Brekelmans Running Camp for Girls. In March 2016, we held the 5K race at Georgetown, which helped reach the final fundraising goal for an endowed scholarship through the Arab studies program in Nina’s name. 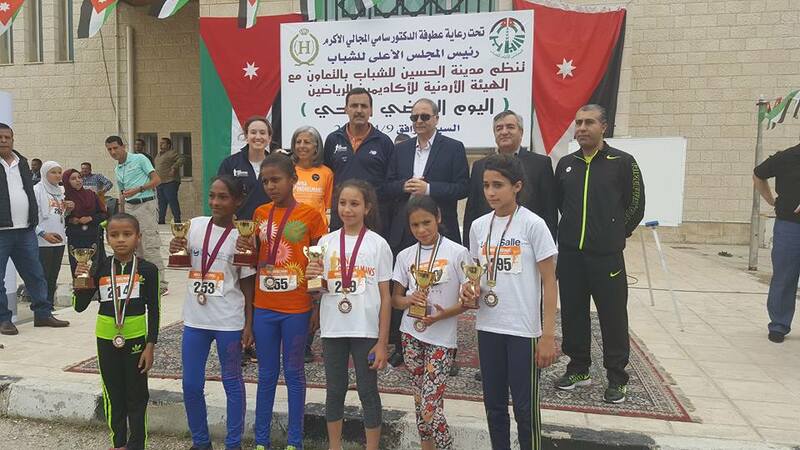 Similarly, that weekend launched the official start of the Nina Brekelmans Running Camp for Girls in Amman. At the end of five consecutive Saturday meetings, nearly 25 girls would participate in the camp, which focused on running and healthy living and included inspirational female speakers, snacks, and games. The camp was organized as a partnership between leaders in the Jordanian running community as well as Fulbright students in Amman. In late March, organizers decided to host our own race for the girls as a capstone event after another race was cancelled. Notably, this would be the first girls-only race in Jordan. I had previously booked a ticket to compete in that now-cancelled race, but fortunately the plans aligned and away I went for the Nina Brekelmans Race for Girls. To my astonishment, nearly 70 girls showed up to Sports City, the premier sports facility in Amman, for a festive race with esteemed speakers, music, and community support. It was fantastic seeing the girls’ pride as they showed off their finishers medals. Equally rewarding was seeing the positive support from mothers, fathers, sisters, and brothers as they cheered on the runners to victory. I returned from Jordan with a renewed resolve to see the camp and race continue. I was also inspired by the grit of our campers and knew that it was time for me to take the next step in my own running comeback. I would need a goal to sustain me through these challenges, and so it seemed like the time to chase the ultimate dream: I would qualify for the Boston marathon. Between April and June, I buckled down and trained, and in late June, I finished second at the Bay of Fundy International Marathon in Maine with a time of 3:20. I was going to Boston. In the months ahead, things picked up for the camp and race as well. We incorporated as the Nina Brekelmans Memorial Foundation and applied for 501(c)3 nonprofit status. The Foundation raised funds and was awarded a State Department grant to double the size of the camp and race. And all the while, I trained--though maybe not as much as I needed to. Saturday, April 15 marked the final day of 2017 Nina Brekelmans Running Camp for Girls. This year, our runners represented the full diversity of Jordanian society, including a large portion from refugee backgrounds. The campers diligently trained and learned weekly about nutrition, strength training, self-confidence, and role models. They heard from amazing runners in Jordan and the United States, including American Olympian Abbey D’Agostino, and enjoyed downtime with snacks and creative activities. On Monday, April 17, I’ll run 26.2 miles from Hopkinton to Boston, which is truly a dream come true. On Tuesday, I’ll waddle to Boston Logan airport and catch a flight to Jordan for the second annual Nina Brekelmans Race for Girls on April 22. This year has been a whirlwind, and there are so many people to thank who made all of this possible. To list them out individually would probably exceed the length of this already wordy blog, so I’ll do my best to keep it short. I’m grateful for Coach Jerry and my GRC teammates for encouraging my comeback and supporting me even when I lagged at the back of workouts. I’m thankful for a great medical team and close friends who believed in me and cheered for me even when things seemed unlikely. I’m forever indebted to the dedicated board members of the Foundation, our rockstar Fulbright organizers, and amazing coaches and volunteers in Jordan who are the day-to-day force behind the camp and race. And finally, I’m thankful for family--my own parents and the Brekelmans family--who have supported these initiatives on behalf of Nina since day one. 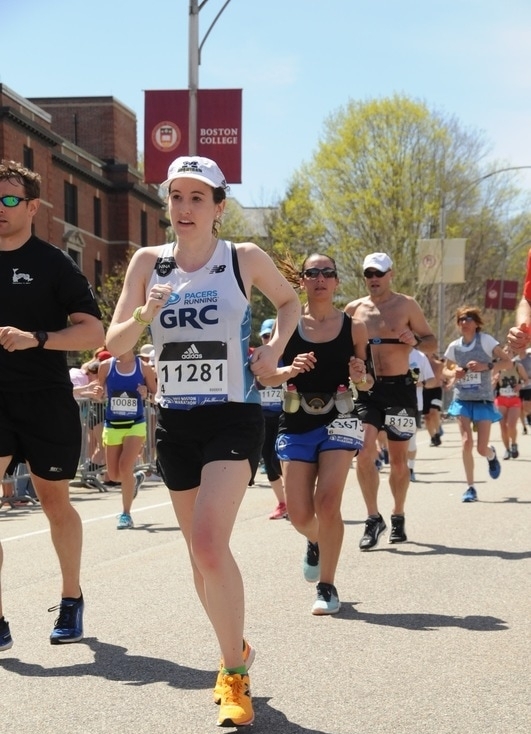 Tomorrow, you can find me in Boston wearing bib 11281 and grinning from ear-to-ear with a “Nina” patch on my GRC jersey. Two years ago on this date I was unable to walk and worried if I’d ever really run again. Now, I’m 26.2 miles away from joining the family “Boston Club.” I never imagined this would be the path to my first Boston marathon, but after all the adversity I consider just being here a victory. This blog was also shared on the Georgetown Running Club blog at http://blog.grcrunning.com/.